Green dresses at 2011 Grammy Award could be great inspiration for your cocktail party. Have you ever think to wear green on a party. Yup, I know that green may not be everyone’s color, but with the right green color, you can look elegance. Green has some variety of color like dark green, rich emerald, lime green, light green, and blue green. So, the key is mix and match. If you have dark skin color, you’re better wear lighter shades of green. But if you have light skin color, I bet you would look great with darker shades of green. So, are you interested enough to wear green on cocktail party? 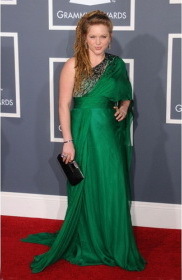 Some celebrities like Crystal Bowersox and Tia Carrere wore magnificent green dress at 2011 Grammy Award. Here are some pictures of them. I hope you can get inspiration for your cocktail dress. Tia Carrere green gown was also fascinating. But if I were her, I would left the fur stole at home, because the dress’s design was really great without the fur. If you interested to wear this kind of dress, you can order it from lightinthebox online store. The price that they offered is US$ 149.99 and they also have worldwide shipping service.